WOU is exploring collaboration with the Methodist Council of Education (MCOE) in equipping their teachers with the relevant teaching qualifications. Three Directors from MCOE met up with the senior management of WOU at the main campus today to discuss the offering of the Post Graduate Diploma in Education (PGDE) programme to their teachers. The MCOE delegation comprised Jenny Qua, Private Education Director, Phoon Yoke Meng, Director of Resource & Training, and Assoc Prof Dr Esther Daniel, Director of In-Service Training. Meeting between the University's senior management and the delegation from the Methodist Council of Education. They met with Vice Chancellor Prof Dato’ Dr Ho Sinn Chye, School of Education, Languages and Communications (SELC) Dean Prof Santhiram Raman, and Regional Operations & Marcom Director K H Chong. In his welcoming address to the visitors, Prof Ho highlighted that more than 20,000 part-time students have experienced learning at WOU and elaborated on the student support services, namely the digital library resources, tutorials and tutor support, easily downloadable course materials, and the learning management system. He also mentioned the various local and overseas collaboration initiatives undertaken to date. Prof Ho shares on the academic programmes and learning support facilities provided by the University. Prof Santhiram briefed on the PGDE programme of WOU which MCOE has identified and is prepared to fully sponsor their secondary level teachers who intend to pursue the programme. He said the 33-credit PGDE programme can be completed in 3 semesters over a period of one-and-a-half years. He assured that WOU can add on courses, as needed, for the teachers. Qua informed that the Methodist Church, which has been involved in education for 125 years, has expanded into private education and now runs six private schools – including the ones in Ipoh, Kuala Lumpur and one set to open in Penang in September 2018 with 1,500 students and over 100 teachers – and a college in Brickfields. 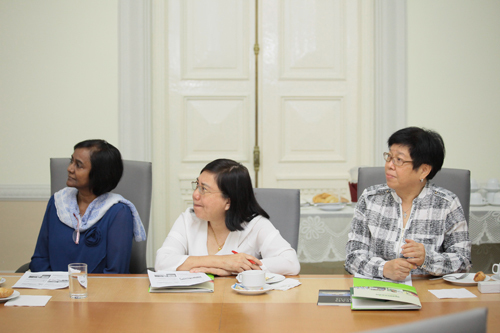 The delegation from Methodist Council of Education (from left): Dr Esther, Phoon and Qua. She said the feedback from the Ministry of Education is that many teachers in the private schools are not suitably qualified. For this reason, MCOE wants to ensure that their teachers possess the right teaching qualifications as they are mostly graduates in specific subjects with some teaching knowledge gained through MCOE’s in-service programmes. As such, MCOE aims to collaborate with WOU by sending batches of their school teachers next year for the PGDE programme, which contains a teaching practicum component and a course on Management and Leadership in Education. Prof Santhiram highlights the courses under the PGDE programme. Qua hopes that as many teachers as possible will become better qualified teachers within the next two years at WOU. She said MCOE will select the teachers from the different geographical regions after reviewing WOU’s academic calendar, course schedule, tutorial timetable and exam timetable, and the teachers’ work commitment. She has also expressed interest in WOU’s Diploma in Early Childhood Education Programme, as MCOE has over 100 kindergartens, each having about 5 teachers.